Rick Egan | The Salt Lake Tribune Pasta e polpette, or spaghetti with meatballs, at Cucina Vanina in Cottonwood Heights. 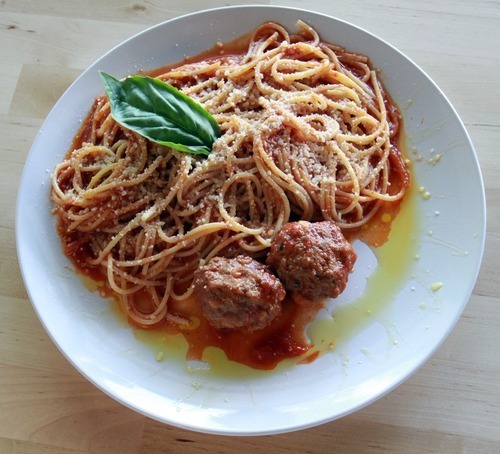 $9.99 at lunch; $16.95 at dinner • Spaghetti with meatballs is surely one of the most recognizable of all Italian dishes. Cucina Vanina's offering is one made with care, passion and pride. Much like the rest of the menu, this dish is an exercise in simplicity, underscored with quality ingredients; a plate of spaghetti coated in a savory tomato sauce, topped with Parmesan and two meatballs . And should you want to try your hand at replicating the dish at home, grab a jar of Vanina's sugo della nonna tomato sauce on the way out for $5.99. Cucina Vanina is at 1844 Fort Union Blvd., Cottonwood Heights; 801-938-9706.